I've been a bit quiet of late. Feeling a little stretched (I've said that a lot recently) and a bit inward. Felt like my blogs were getting a bit whiny and taking that old "if you can't say something nice then say nothing at all" stance. But this is my blog right? And I blog about my real life day to day. Truth is my real life day to day has been a little sucky lately. So whiny or not, I'm going to blog. I feel like I have 3 kids who are all at tricky ages at the same time. When I was pregnant with Harper I was so worried about how I was going to cope with that first 12 months. The thing is those first 12 months were OK, not a picnic all the time but a baby under one has pretty simple needs to fill. Access to the breast, arms to be held in and sleeping close when tired. I had forgotten what an almost verbal toddler was like. And I never factored having that with a 3 year old at the same time. And I didn't know Tannah would be having a rough time at the same time as all that. And that this would all happen in a cold and dreary winter when my SAD's would be all up and in my business. Tannah is highly sensitive at the best of times. Has been since birth. But she is on hair-trigger at the moment and I can't nut out what is making it worse. Willow is about to turn 3. Threenagers are entirely delightful and incredibly frustrating at the same time. It's a transition from little to big kid and I get that it is as tough for them as it is for me, but still. Three y'all. Harper is in the cranky frustration of having a whole new world of wants that she can't quite articulate. There is a lot of grunting and pointing...and tears when I can't figure it out. To ice this cake Luke is working 6 days so I'm just plain tired and so is he. Being tired and a little stretched for cash affects how we eat. I read something that got my hackles up the other day about how children (and adults) reacting to preservatives, colours and over processing of food was all in people's heads. I know what my family is like when we eat real food and what we are like when we don't. The two are not the same. And it can be a vicious cycle. Feel crap and tired from eating crap and can't be bothered cooking from scratch or too $$ strapped to buy better and it spirals. I know it has here and I know we have to get back to my goal of 90% real food and 10% whatever else. I also feel like we are transitioning to a family of older kids. I can go out for dinner with my friends or to the gym and Luke can have a night hanging out with his mate and it's not a drama. Breastfeeding is still important but not like when your babe depends on you for sustenance. Sleep is happening! Harper only wakes a couple of times a night and Willow hardly wakes at all. Harper refuses to be carried in a carrier and my trusty old ergo sits unused. I know I should probably sell it but it's seen some miles and milestones. I often go out with 2 walking children and one in a stroller. It feels strange sometimes I must admit. And Tannah has outgrown a lot of the Dr Sears "7 B's of Attachment Parenting" . Now I'm fumbling my way through remaining a connected parent to her when she is so grown up and finding her own way. So that's me at the moment. There have been some awesome adventures and plans happening as well. But I could use a cup of tea and a lie down, or a rostered day off and my tiles could do with a good mopping. That's a lot to deal with. (((hugs))) I can relate to a few things you said, the ages and stages, feeling stretched, lack of finamces and dealing with SAD at the same time. You're not alone! Transitioning to APing and older child can feel a bit like losing a connection, but have faith, the new form of your connection with your older AP'd child will unfurl into the most beautiful blossom. I've discovered a new depth on connection with my boys that i couldn't have imagined 5-7 years ago. More than ever before i now see the true value of all the co-sleeping, breastfeeding, babywearing and gentle parenting (even though i constantly thought i wasn't gentle enough)... The best is yet to come! And I've found yours! 1st, sounds like you are doing a kick-a** job raising three daughters. It will change the world, I believe this. 2nd, sometimes it feels like and a** kicking, doesn't it? Little is harder than a pre-verbal toddler, so hard for them, and so hard as parents to cope with the frustration that comes with it. 3rd, if you have nothing nice to say about where you are at the moment, say it anyway, because it's how we form connection and communicate in a real way. And finally, I live in a place with loooong winters and lots of grey days, little sunlight, and most certainly, it's wearying. Glad I've found Yay for Home, write on! Your last few words had me nodding and laughing... such a good analogy... no major spills causing the stickiness at the moment but the whole floor could do with a good mop... I so get that! 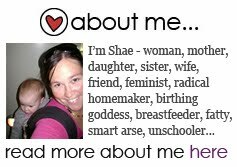 Ah Shae, I love your blog posts, warts and all. They are so full of LIFE, real life, not life stitched together with pretty words to make a thing not quite real but aspired to. I'm reconnecting with my eldest after what feels like a year or two of disconnection so I really hear you on your eldest. It will come together.